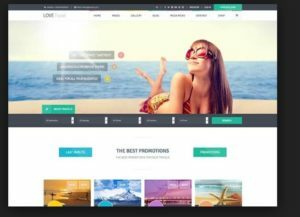 There are numerous best collection of free and premium WordPress travel themes available for travel agencies, tour operators, travel blogs and tourism business website. In this post, you will find advanced and most powerful WordPress themes for travel blog which will be worth for you. All the listed below themes are free as well as the premium with attractive design and awesome features to satisfy the users need and demand. These themes are provided with Google Maps integration, automated reservation system, custom page types for travel packages and other related stuff. This post will be suitable for both professional and personal needs. Hope this WordPress travel themes will be helpful for you. Travelo is WordPress travel booking theme. It is very popular for its great skin and layout and it has an excellent booking module to book any type of hotels and tour. It is a completely flat, very responsive and mobile friendly theme. This theme is built with the latest BootStrap frontend framework. This theme is blended with a custom icon pack and font awesome icon. Has a wonderful PayPal payment system, hotel booking, signup/login module. It has other excellent features which are reliable for your website. Travelo is the best choice for everyone to create a professional travel agency website. Altair is one of the best and highly rated WordPress travel agency themes. This theme is very clean and modern used for the travel agency and tourism booking. Travel tour theme is integrated with 6 different content page template which basically supports full width and fixed width layouts. The most important part of a travel agency is its booking system. Altair has a creative booking system that will definitely impress the customers and it is user-friendly. One of the important features that will be helpful for the customer would be the advanced search option. There are many advanced features in this theme such as custom colors, custom typography, Google Font, Backup etc. It’s very simple for you to create an amazing destination page to attract your customers using a built-in parallax background module. Compared to other WordPress travel themes, Altair seems to be best. Love Travel theme is one of the best creative WordPress travel themes. It is a multipurpose theme which has tons of features and customization options. This theme is specially designed for a travel blog, tour operator, travel agency websites. It is quite surprising about its creative design, graphics, modern, simple, flat and clean which is well suited for business purpose websites. Especially for people who love to travel around, this theme takes an important part. The main aim of this theme is for you to create a successful travel agency website to attract people. Nation Hotel is the most responsive WordPress theme built using the latest HTML5 and CSS3. This theme is specially created for Hotels, Guest House, Motels, Hostels, and any other hospitality businesses. 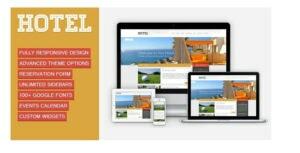 You can design an amazing hotel website with the help of this theme. This theme lets your customer get an instant reply. This theme has a build in the booking system which is ready to use at any time. There is also a pre-designed template. Nation hotel theme has many features such as premium revolution slider, fully functional reservation system, user-friendly reservation page etc. PayPal payment is included in this theme. So once your customer confirms their booking, they can pay the amount through PayPal account or by using their credit card directly. This theme supports multilingual plugin so you can translate to any language whenever required. This theme is SEO optimized. 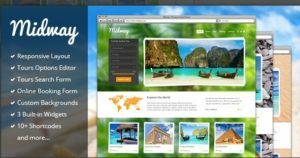 Book your travel is the 1st selling WordPress theme for a travel agency, tour operators, hotels, villas, apartments, resorts, for rent a car and other tourism-related. It is a modern as well as very responsive theme. This theme is multi-lingual, so at any time you can translate the language. There is an option to change the homepage by rearranging the widgets. This theme has a valid working reservation and booking form. Since it is integrated with woo-commerce you can sell anything online. The customization is very simple but has a powerful web interface. This theme is SEO optimized. Hotel and travel business mainly use the Soho hotel theme. It is a very responsive theme and has a fully customized booking system. Latest web technologies are embedded in this theme. It helps to manage developers provide free detailed documentation to get started with. It allows you to create a hotel website and attracts the customers to book their rooms online. Soho theme has an inbuilt room availability checking feature. There are many other advanced features like seasonal price, occupancy limits, date blocking, optional extras, coupon codes, drag, and drop editing etc. The payment mode is also very easy for users. Viva Hotel theme is rich in features and this premium theme lets you customize completely a wide variety of professional easy to use features. It is generally for hotel websites. 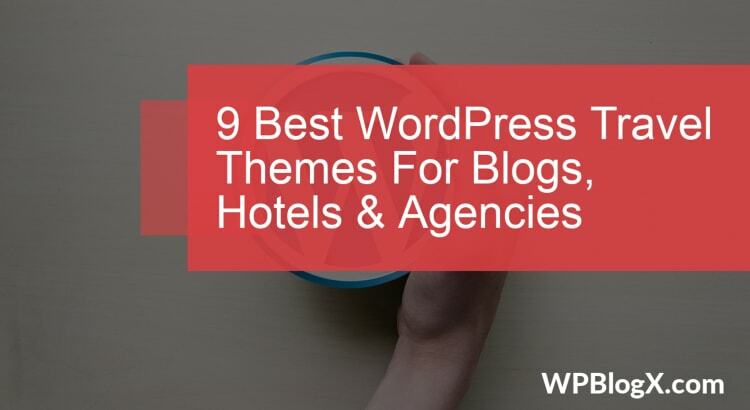 With the help of this theme, you can create a website with hotel features. It can be also used for services and locations, online booking. You can use events calendar plugin to your website which helps in displaying upcoming events. It makes your website look interactive and interesting. Here a feature reservation form is available, with the help of it, the visitors can reserve the rooms in prior. You can choose your own styles from multiple color schema. The travel company website mainly uses the tour package theme. This theme is very simple, modern and fully responsive. This theme comes along with a post type package. It permits to list information about travel packages and provide you with a simple booking system. Tour package theme looks stunning on any devices like iPhone, iPad etc. Since this theme is multi-lingual you can translate to any language you required. It is SEO friendly and SEO optimized. You can use a woo-commerce plugin for any shop and other e-commerce features. The payment mode is also very easy in the tour package. Midway is one of the best travel WordPress theme. Travel agency mainly uses this theme. Midway is extremely very simple and convenient to use. It is a multipurpose travel theme. Multipurpose states that you can use this theme for any kind of travel websites. It lets you plan a wonderful trip. In theme also has an inbuilt booking form. The settings in this theme are very easy to change. This theme is very easy to use. Its customization comes with powerful tools for searching and booking tours, managing, changing styles etc. Best WordPress travel themes are really worth installing it on your WordPress website. These themes are very responsive and user-friendly. So the users will have a good look and feel the experience. You can use these themes as per your requirements. Hope you got an idea about the best WordPress travel and tour themes. If you have any queries please feel free to comment on us. You can subscribe us on Facebook and Twitter.